I know I said I wouldn’t do any Christmas posts early, but I really couldn’t wait to share my Christmas wreath! Since I’m technically only a few days early I don’t feel that bad, because I could’ve been posting things right after Halloween. And we all know how I feel about that! (If you don’t, click here)Do you remember the Fall wreath I made back in September? 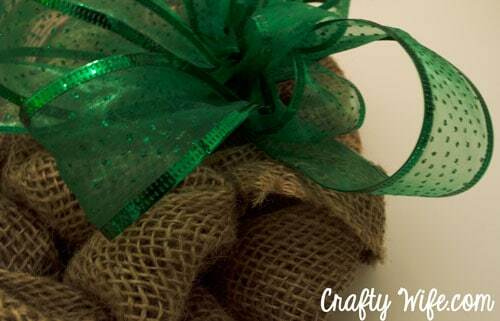 Well, I liked the burlap so much that I decided to just take the decorations off of it and use it for Christmas. Not only was it super easy, but it was also cost effective. I used this wreath for inspiration and got started assembling my own. It was pretty easy once I figured out how I wanted everything to look and got the ribbon in place. 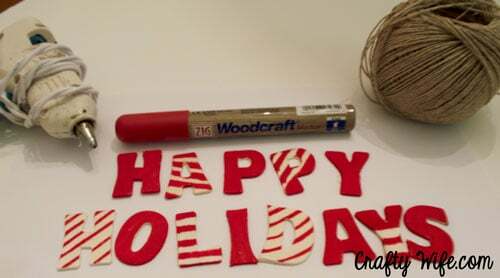 I really loved the idea of using wooden letters for a small message that would hang on the wreath. 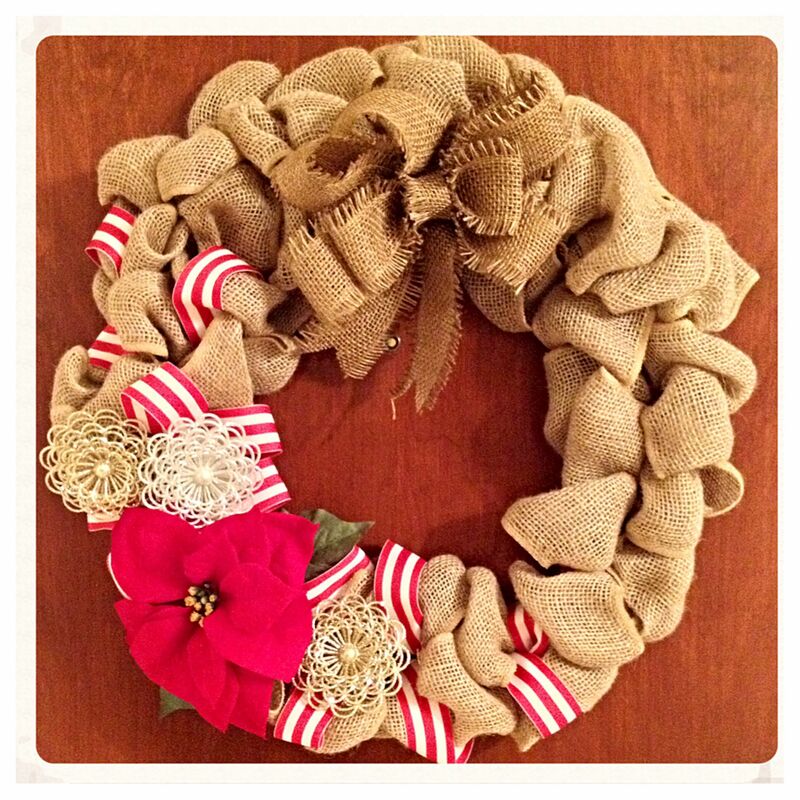 And it was pretty easy to glue the jute string on them so that they could hang (loosely) once attached to the wreath. I also really love anything sparkly which is why I was immediately drawn to the green ribbon. I am also a sucker for polka-dots. Once I put all the components together, I sat back and took a look at the wreath. I really really love it. I wasn’t sure at first how it would translate from my head onto the burlap but I am very happy with the way it came out! Later on I did add some gold bells to the bow and I also straightened it a bit, but otherwise it looks the same. 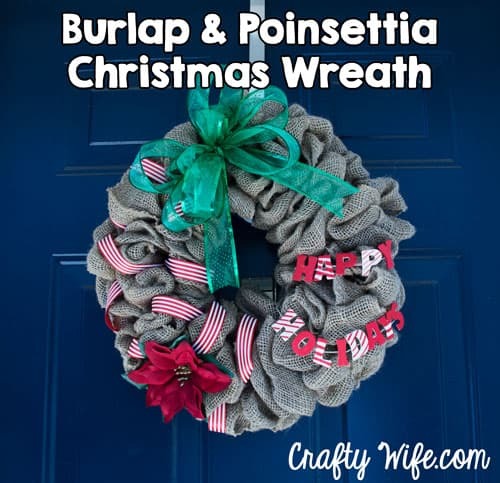 Do you put up holiday wreaths? When do you put them up and when do you take them down? I’d love to hear from you in the comment section below! So cute! I really like the burlap wreaths, they seem so traditional and classy 🙂 I might have to try making one this year. Can you remove the Christmas stuff from yours, to use for the next holiday? I’ll put up my Winter Berry outside wreath the weekend after Thanksgiving. I’m wanting to make a wreath with all the ornaments, like I keep seeing on Pinterest. They look so cute, and easy to make, and more holiday oriented. Thank you! The base for this wreath is actually what I used for my Fall Wreath, minus the decorations. I used wire to tie everything onto the burlap but made it loose enough that I could cut it off easily and replace the decorations with whatever the season calls for, Chris loves that I can use the same base every time without spending more money and I love that I can still decorate for each season in a cost effective manner.